lily (shades of purple and pink). The hammock is made out of GOTS certified organic cotton, and the spreader bar is constructed out of FSC certified bamboo. It requires at least 200 centimeters of space (in height) to hang properly. This hammock chair is designed especially for kids– the high-quality organic cotton hammock is soft and comfortable, but also supportive and safe. The swing has a solid, durable construction that will permit the heavy use that comes with playing and fidgeting children. In addition, it has been put together so that it is resilient enough to hang indoors or out, making it an excellent addition to a patio or a child’s bedroom. The two different color options are suitable- Froggy for boys or Lilly for girls. The swing is spacious enough for most children, and smaller children will be able to recline enough to sleep or stretch out. 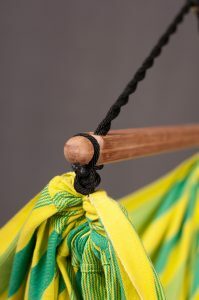 Especially with a kid’s hanging chair, which is used not only for sitting in it but also for swinging, it is important to ensure high quality of the product. This hanging hammock chair will swing enough to excite children, but not so dramatically as to be unsafe or unstable and bears the GS seal for “Tested Safety” which ensures that the product meets the highest safety standards. The Organic Hammock Chair for Children LORI by La Siesta is eye-catching and fun, but unlike many other pieces of children’s furniture, it is also very well-made– the entire chair is solidly built out of high-quality, ethically made bamboo and organic cotton. The product’s solid construction is its biggest pro. The whole chair weighs only 2.4 pounds, but it is sturdy, safe, and resilient enough for indoor or outdoor use. This product is easy to clean, too; for normal cleaning, it does well if placed in the washing machine on cold and then set out to air dry. It is sized appropriately for children up to about twelve years old, though particularly large children may want to look into an adult-sized chair. Though the product is sturdy enough to withstand outdoor use, it does suffer some cosmetic damage: extended time outside results in some of the colors fading and minor hardware rust. 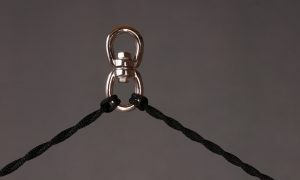 The set contains the hammock chair and the swivel. The biggest con is that the hardware needed to attach it to the ceiling is not included with the chair. The company does make a high-quality ceiling hook, but it must be purchased separately. 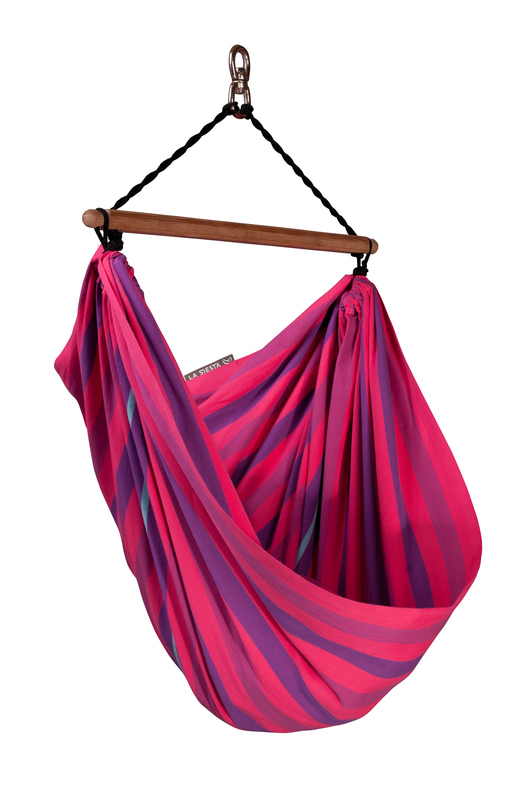 This is an excellent, well-made, aesthetically appealing hanging hammock chair for kids up to their preteen years. It is safe, comfortable, and resilient enough for either indoor or outdoor use. A kid’s hanging chair of roughly equal quality is the Hanging Nest JOKI by La Siesta (our review), which features a cocoon-like feel and removable cushion. Another similar is the hammock chair IRI rainbow which is not made of organic but nevertheless high-quality cotton.